Skateboarding is a sport that has been insanely popular over the past thirty years thanks to famous professional athletes like Rodney Mullen, Bam Margera, Geoff Rowley, Rob Dyrdek, Ryan Sheckler, and of course the beloved Tony Hawk. From X-Games to video games, extreme sports such as skateboarding have taken the world by storm and sparked the interest of millions of youth. 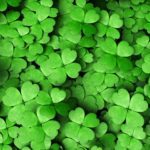 Skating is a lifestyle as much as it is an athletic activity, and there is much to be appreciated about the culture– art, music, tattoos, fashion, and more. Whether you specialize in street, vert, or are working on nailing your first kickflip, here are 6 stellar skateboarding tattoos to honor the sport. Much like art, skateboarding is something that people eat, breathe, and live. Without it, they may not have anything else. 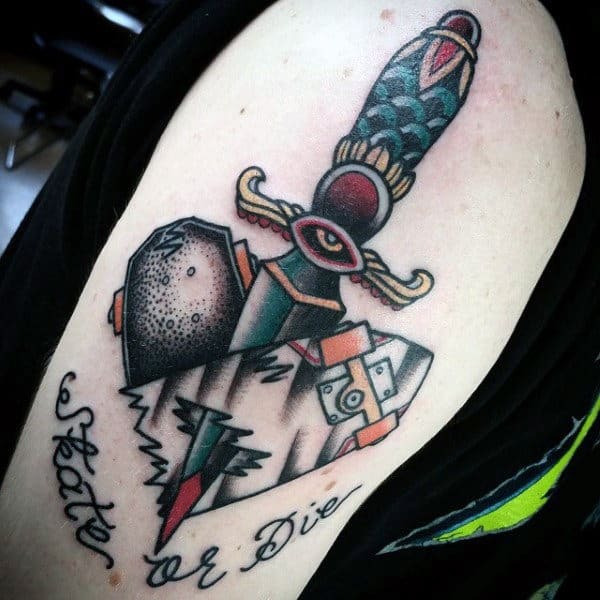 This “Skate or Die” tattoo is done in a beautiful American traditional style and truly gets the point across. Fans of skating may also remember the iconic Tech Deck fingerboards from when they were sitting in class waiting for the countdown to the bell at the end of the day. How many of theses did you have taken away as a kid? 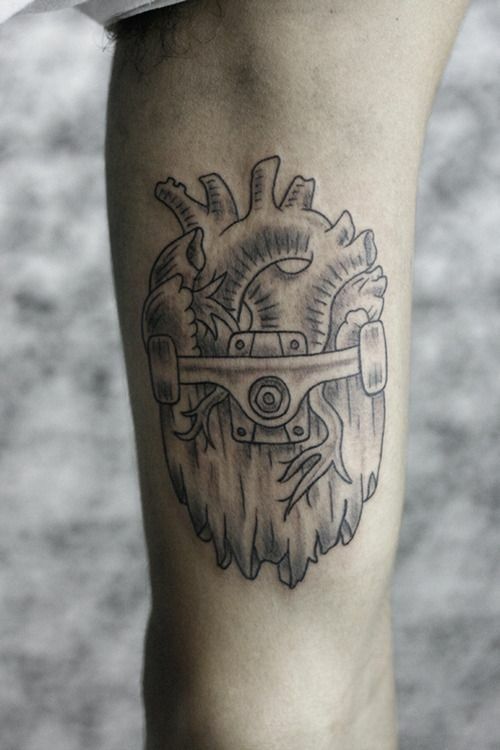 This traditional style piece incorporates skateboard trucks and wheels into a wooden beating heart. The black lines keep it simple, but the message in the splintered wood is strong and clear. 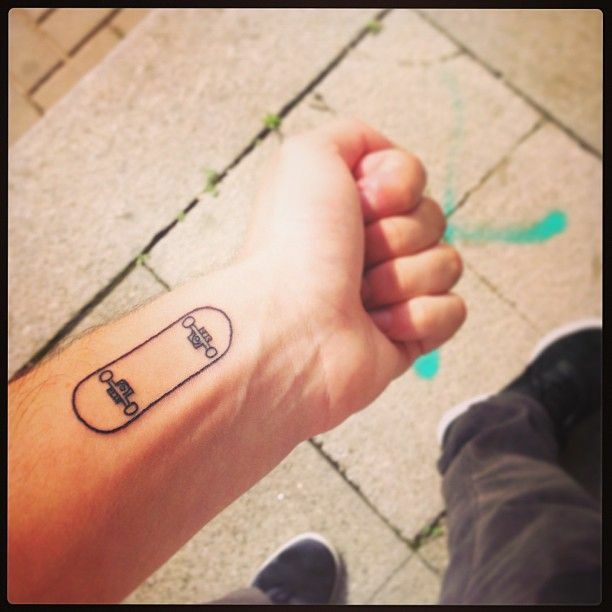 Here is an adorable and cleanly done wrist tattoo of a simple and complete skate deck. It is pretty straightforward, but it shows a love for the hobby without being overbearing. This “Skate or Die” piece is a bit more rugged and tattered. It has a punk rock vibe in the torn banner and splintered deck. The rough features of the piece make it genuine. 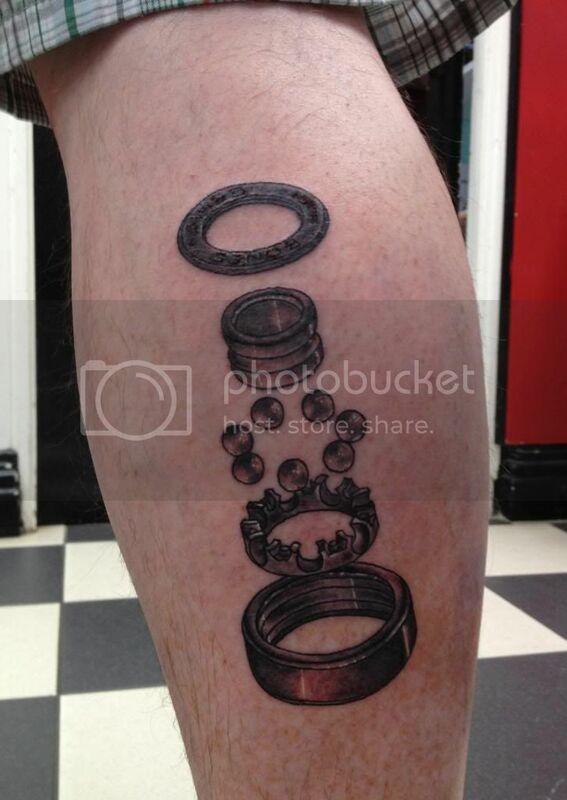 Lastly, here is a more subtle yet complex tribute tattoo to skateboarding. It is a realistic deconstructed skate bearing, which is the source of the wheels’ ability to turn. Without bearings, skaters wouldn’t have as much speed and control, if the ability to move at all!